Lawyers for one of the convicts incarcerated in the GYEEDA scandal has filed an appeal against the 12-year sentence handed their client. 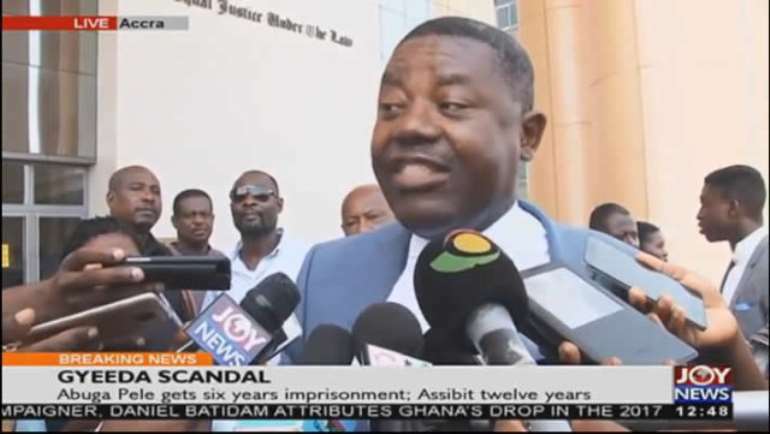 One of the lawyers, Kweku Paintsil, told Joy News the trial judge erred in law when she found Philip Assibit guilty of 12 counts including dishonestly causing financial loss to the state. He argued given the facts as argued out in court, “an impartial arbiter will come to a different conclusion” from what Justice Afia Serwaa came to. His client together with Abuga Pele, a former Member of Parliament as well National Coordinator of the National Youth Employment Program were handed a 12 and six-year jail term respectively after about three years of litigation. The two had 19 counts including intentionally misapplying public property and dishonestly causing loss to public property. Mr. Assibit is accused of putting in a false claim for payments to the tune of 3.3million cedis as services provided the then NYEP. This included developing an exit program and securing a grant of 65million cedis from the World Bank. Mr Pele is alleged to have entered into the agreement with Mr Assibit and prevailed upon the state to make payments when no work has been done. Before sentencing, the lawyers pleaded with the presiding judge Justice Afia Serwaah Asare Botwe for lenient sentences. Paintsil asked for not more than six months for his client. He explained the prisons are full and his client is a chief and an entrepreneur who has an "unnumbered children." On his part, Abuga Pele's legal counsel Abu Juan also asked for not more than six months explaining his client is a former Member of Parliament and was actually an MP when the trial started. They believe he lost his Chiana Paga seat in the Upper East Regional parliamentary primaries as a result of this case and that he has a family. The appeal for leniency did not appear to have resonated with the trial judge who handed severe sentences to the convicts. But lawyer for Assibit is convinced the judgment is not a true reflection of what happened in court. After filing the appeal, he told Joy News he is convinced his client will be freed on appeal. He said Philip Assibit is in “good spirit” and hoping for a turnaround. Meanwhile, a former Deputy Coordinator of what used to be the NYEP Jacob Adongo believes the judgment is a travesty of justice. He does not understand how Assibit and Pele will be found guilty when other individuals and companies including Zoomlion and Rlg were only made to refund the cash they appropriated through the same GYEEDA scheme.